What a picture!!! Bull snake climbing up a kitchen window in Carefree! Carefree (PW) Nancy Westmoreland noticed some movement last summer in her kitchen window and to her surprise, noticed a bull snake stretching up the glass. She quickly went outside and snapped this photo of the scene. 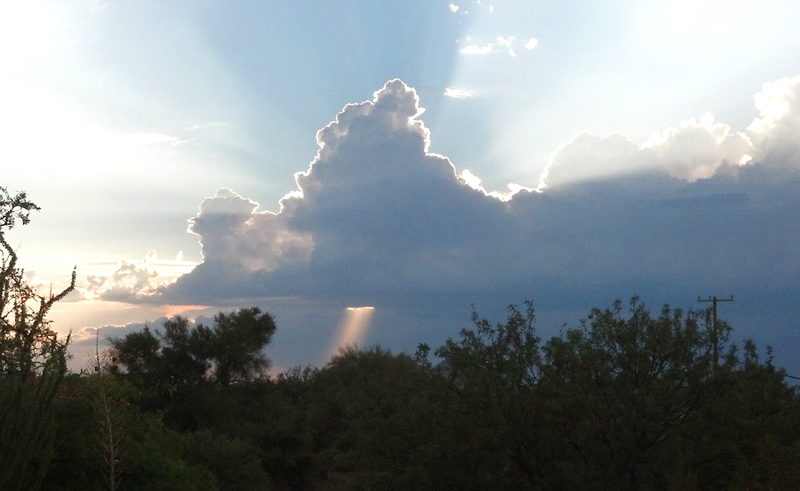 ABC15 weathercaster Randy Kollins liked the photo enough to run in on several newscasts. Bull snakes are popular among desert dwellers since they can even kill a rattlesnake and keep the rodent population down. What's going on here?Photo courtesy of MGM Pictures Scroll down for the answer! 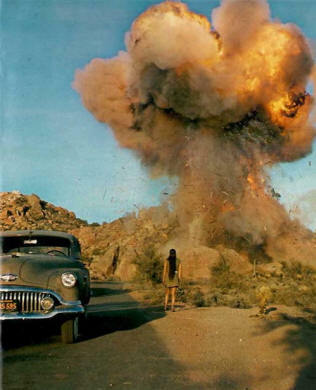 In the climatic final scenes of the movie Zabriskie Point, filmed in the Carefree area, the stunning Boulder Reign home of Rusty Lyon's, had to be blown up. MGM special effects wizards constructed a scale model of the home near the rock cliffs where the community of Winfield is today, at the site of the old Carefree Studios. That's what was detonated in the picture above. Some say if you find the right place, you can still see the scorched rocks! Carefree's "Wedding Cake House" a Sotheby's "Listing of Distinction"
Carefree (PW)-A Carefree landmark house has been singled out by Sotheby's International Realty as a "listing of distinction" in their Collections Publication sent to 13,000 agents worldwide. The unusual and distinctive residence, on one of Carefree's best homesites, has touches of design from the noted 15th century architect Andrea Palladio. Sotheby's informed agents that Thomas Jefferson had also taken design elements from Palladio, when he designed his famous home at Monticello. The home features a 24-foot entry rotunda with a faux Romeo and Juliet balcony and leaded glass windows. The triple layer home is served by double elevators and got it's nickname from the arched porticos that resemble icing on a wedding cake. The home is listed for sale for $5.9 million dollars. Click here for more! Carefree (PW)- Of course Cave Creek is the "West's most Western Town" even if Scottsdale got to the patent office first and trademarked it for themselves first. I remember arriving in the area back in the early 70's, and driving up Scottsdale Road. What I saw didn't match the signs that proclaimed "the West's most Western Town." Outlaying areas like Rawhide, Pinnacle Peak Patio, and Greasewood Flats always reminded me more of the West than downtown Scottsdale. It was surprising to see the town was locked into this time capsule. But go to Cave Creek today, and there are reminders all around, to the 1860's rip roarin' mining camp and cattle days. You'll see Harold's Corral where the stage use to stop, and the cowboys in the summer use to have a contest to see who could sit on a block of ice the longest, right there on that very floor you are walking on today. There are rodeos and parades, in town, the Tonto Bar and Restaurant operated out of the original homestead house, there's an annual running with the bulls, and the Buffalo Chip still has bull riding twice a week out back. There's a horse and walking trail that travels all through town and up Schoolhouse Road, and don't forget the actual cave where the cavalry passed by, after getting water out of Cave Creek, on their way from Ft. McDowell to Ft. Whipple, traveling on the military road, still a principle street in town. From Cave Creek Museum with a working 23-stamp mining mill, to Paulo Soleri's first home he even built, Cave Creek is enjoyed by thousands every weekend, who relish the trip up from Phoenix and Scottsdale, to go 100 years back in time. After all, it's the World Headquarters of True West Magazine where the great historian, writer, and artist Bob Boze Bell holds court! They may have not trademarked the slogan, but you would be hard-pressed to find a community that so embodies the spirit more than Cave Creek, Arizona! 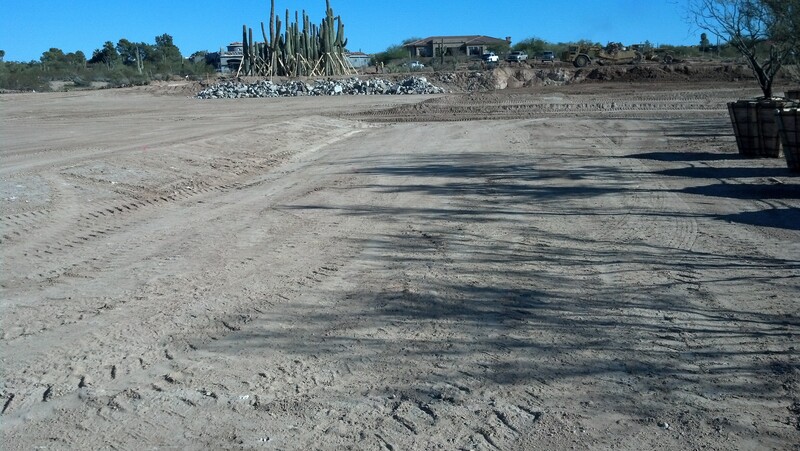 Twenty-two new homes under construction in Carefree! (Carefree (PW) There's a Carefree connection to the famous Octave Mine property just featured on season two of the SyFy Channel's spooky show "Ghost Mines". A Carefree family owns the 266 acre patented property and the Carefree office of Russ Lyon Sotheby's International Realty has listed the property for sale for $5.9 million dollars. Harold's Corral sign, in the heart of Cave Creek, now using the slogan "Where the West Begins!" PHOENIX — For 66 years, Scottsdale has playfully called itself “The West’s Most Western Town,” a nod to its early years of hitching posts, Western storefronts and long-gone dude ranches that have been overtaken by contemporary high rises and South Beach-style nightclubs. The shift toward a more urban metropolis — more Los Angeles, less Wickenburg — has prompted some people to ask: Is it time for Scottsdale to find a new slogan? “When is the last time you’ve seen a bolo tie or a cowboy hat and boots on a gentleman in our stores, bars or restaurants?” wrote resident Patricia Dooher in a letter to the editor to the Scottsdale Republic this month. Dooher urged the City Council or Chamber of Commerce to sponsor a contest to find a more appropriate nickname. In recent years, Scottsdale has made efforts to promote and retain its Western brand, pumping millions of dollars into an expansion at the Tony Nelson Equestrian Center at West World and planning a Scottsdale Museum of the West, set to debut late next year. The city still boasts a number of Old West-themed businesses, including Pinnacle Peak Patio, Greasewood Flat and the Rusty Spur Saloon. The annual Parada del Sol is still held in the city each winter, featuring plenty of riders on horseback, and a rodeo is held at WestWorld. But other Western haunts have come and gone. The Rawhide Western Town entertained visitors for 34 years before trotting out of town in 2005, relocating to the Gila River Indian Community near Chandler. The shuttered Pink Pony Steak House, Old Town Scottsdale’s oldest restaurant, plans to reopen this year after an extensive remodel. “I would hate to lose that,” he said. Scottsdale can maintain its Western image and still be modern, Lane said. Saying Scottsdale “can’t stand still and be in 1910 forever,” Lane offered a slight change to the slogan. In recent years, Scottsdale has seen a proliferation of trendy bars and nightclubs in part of its downtown, just a short drive north of its traditional Old Town area that seeks to retain a Western flair. In addition, high-end shopping centers, luxury resorts and homes, golf courses and high-profile events such as the Barrett-Jackson collector-car auction, Waste Management Phoenix Open and spring-training baseball have drawn more attention than the Parada del Sol and its related rodeo each winter-visitor season. City officials also have drawn criticism for its recent approval of several high-rise apartment and condominium projects. Critics suggest the buildings will change the landscape and harm the city’s long-time appeal. Dan Semenchuk, a downtown Scottsdale advocate and unofficial spokesman for the area, said he moved there with his wife from Denver in 1980. “We’ve always felt that Denver, as well as the surrounding cities of Cave Creek, Wickenburg and Prescott, have more Western character than Scottsdale,” he said. If there is a “West’s Most Western Town” in Arizona, “it should probably be Tombstone,” he said. Despite the changes, traditionalists aren’t about to turn over the slogan anytime soon. City Councilman Bob Littlefield said the decades-old motto is part of Scottsdale’s cache, designed to lure visitors hankering for a taste of the Old West. Cave Creek is the latest Arizona town to jockey for the title. The Cave Creek Merchants & Events Association was talking of developing a “friendly” competition between the neighboring communities, which could take place just before Cave Creek’s Wild West Days in early November, said Fran Booth, membership director of the association. But under threat of a suit for copyright infringement, threatened by Scottsdale, the Town of Cave Creek dropped any plans to adopt the slogan "where the Wild West lives!" Except that is the slogan for Deadwood, South Dakota.. . . oh well!